Whether you are looking for a cheap last minute holiday, an all inclusive family hotel or a luxury 4 or 5 star property, Malta & Gozo has a wide variety of holiday accommodation to suit everyone. Everywhere you step upon this amazing island there seems to be a reminder of its rich and colourful past. Its key location has been a prize for invaders over the millennia including the Greeks, Knights of Malta, the Sicilians, Muslims; Bonaparte’s French to name but a few until at last the island became a part of the British Empire in 1814. A love affair with Malta by the British had begun, a major naval base was established at Valletta and generations of sailors enjoyed the hospitality of the friendly islanders. When the tourism boom blossomed in the 60’s and 70’s Malta’s climate and welcoming locals soon became a popular destination for UK visitors. Sliema is located just outside Valletta, its rocky beach is around 5 kilometres long and provides a variety of watersports, families also appreciate the lidos dotted along the beachfront that provide safe swimming and sunbathing. Sliema has a sophisticated night time vibe with wine bars and trendy pubs a-plenty. Close to Sliema you will find St Julian’s Bay a popular resort with young couples and singles. There's a plenty of watersports available from the rocky beach, a great selection of accommodation and a good lively nightlife with bars, restaurants and clubs. St. Paul’s bay is home to the resorts of Bugibba and Qawra; Bugibba is a small but bustling destination with a plethora of hotels and apartments and also boasts a 150 metre man-made beach and a recently opened popular waterpark. The adjacent resort of Qawra blends in to the livelier Bugibba here you will find a rocky Blue Flag beach with a picturesque setting, water-skiing, jet-skiing and scuba diving. Qawra also benefits from several lidos with pools. Mellieha Bay has the best sandy beach on Malta. Its location on the island's west coast is set away from the more central holiday areas if you wish to do some exploring car hire may be an advantage but the public transport is good too. There are bars and restaurants set along the bay. Accommodation is available down by the sea or up the steep hill in Mellieha village away from the beach, and here you will also find restaurants, bars, and cafes. Gozo and Comino are truly special places; Gozo is a peaceful backwater with Baroque churches and ancient stone farmhouses dotted throughout its countryside. If you are staying here take time out to visit Gozo's rugged landscape, spectacular coasts, diverse beaches and discover why its waters are a haven for snorkelers and scuba divers. For accommodation Rabat, Victoria, Xaghra, Ghajnsielem, Marsalforn and, Xlendi, provide a varied selection of good quality three and four star hotels and self-catering accommodation. If you love the sea then Comino is the Island for you. For an ideal day out take a boat trip to the island's Blue Lagoon, with its turquoise waters and safe bathing contributing to a memorable holiday experience. The island is tiny and other than just one hotel is uninhabited but is surrounded by some of the most crystal clear waters in the Mediterranean. Comino is also great for walkers and photographers. (2) Mdina - Mdina is Malta’s ancient capital, its winding narrow streets seem to be preserved and take you back in time. The atmosphere here is almost spiritual and the lamp-lit evenings are particularly surreal. Several historical attractions are worth visiting here and you also get great views of the island. (3) Beach-life - For sun sand and sea combined with a Mediterranean climate the island is a great place to relax, check out Mellieha Bay and Golden Sands and a boat trip to the Blue lagoon in Camino is a must. 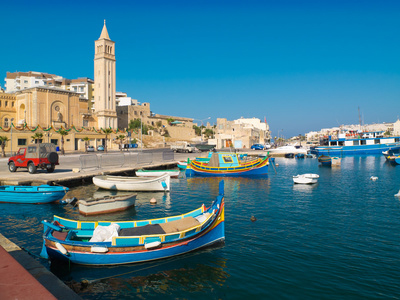 (4) Diving - Malta is a major attraction with thousands of scuba divers drawn to the island every year to sample the crystal clear waters and observe the diverse marina life. (5) Walking - Winter, Spring and Autumn offer the ideal climate to walk the Maltese and Gozo countryside. Gentle hills, dramatic coastlines, isolated inlets and secluded pathways are a great way to get to know these islands. (6) Gozo - A half hour ferry trip takes you to this rural island north of Malta. It has a more laid back vibe, friendly locals, open countryside with sleepy villages offering traditional arts and crafts. Attractions here include; the Ggantija Temples,Citadella, ta’ Pinu Sanctuary plus the Dwejra area. (7) Megalithic Temples - Scratch your head in wonder how these amazing prehistoric monuments were constructed, visit the site at Ggantija and the Hal Saflieni Hypogeum. (8) Village Festivals - As in many southern European countries, religious festivals form a huge part of village life, the efforts that whole communities bring to these parades is admirable and they attract locals and visitors alike it's definitely worth the effort to attend one of these ceremonies.